Two figures are falling from a burning tower, struck by lightning. The lightning symbolises a moment of enlightenment, or breakthrough, while the tower itself can be the way we live – home, finances, relationships, health – or the outer persona that we show the world. It’s also a symbol of the past, and can be associated with pride and ego. The Tower is numbered XVI, which reduces to seven, the number of possibility and mystery – the mind of God, destiny, or Fate: a power beyond our control. The Tower reveals unexpected change, often resulting in shock or loss. The upside of the card is relief: that sense of foreboding is over, tension gets released, and you can now deal with the aftermath. It is important to emphasise that you are not to blame, and that this card does offer an opportunity for a clean slate. You can now create whatever you choose, stronger and wiser for the experience. Power Message You don’t need to over-think. Accept that certain things happen, and see what possibilities are now opening up as a result. The Angel of Hope kneels by a pool of water. Like Temperance, card IV, she is pouring water from two vessels. She waters a large pool, and a small patch of earth, which flows into the pool. The pool represents the present and the earth signifies the past. She knows that the water will bring the reward of growth. The twilight signifies intuition and spiritual guidance and the stars, wishes. The card is numbered XVII, which reduces to eight, the number of change and renewal. 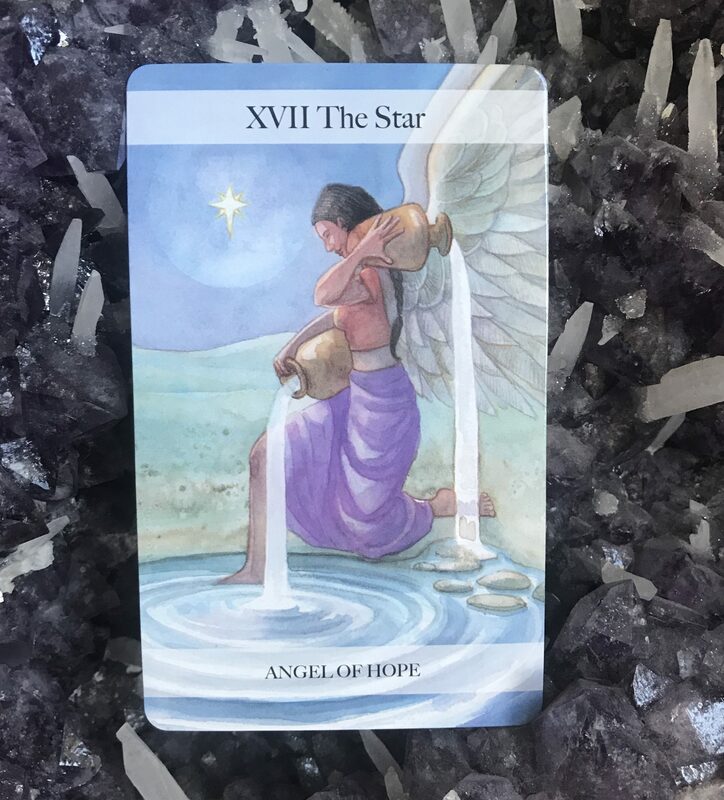 The Star brings you hope and healing, and a way to realise your dreams. By following your intuition you will discover the right path. Opportunities are coming your way; choose those that will help you express yourself as you are now rather than as you once were. This card also comes up in readings to show recovery from stress, and new ideas emerging. It’s also a spiritual card, showing healing work and the need to share your work and gifts with those in need. Power Message Let your intuition guide to toward a path of healing and creativity.